The “USB Dome Button” is a palm switch with a large mushroom dome. It connects to a workstation or PC via a USB cable. A press on the button sends a keystroke (or a mouse button click) to the workstation. You can configure which keystroke that is. 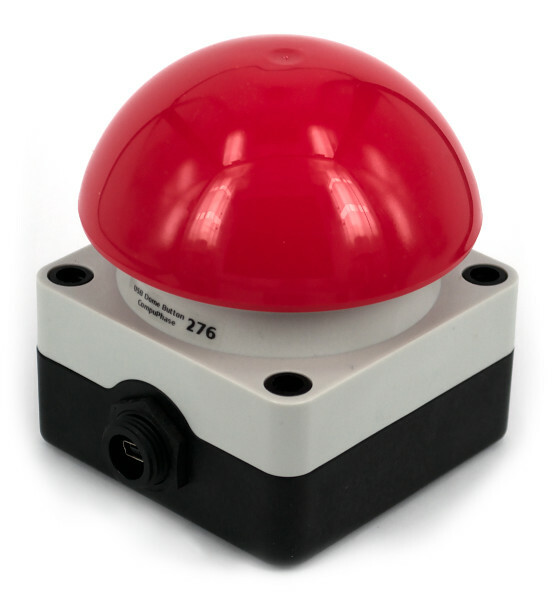 You can use the USB Dome Button to perform any command on the workstation: launch a presentation, start a show, pause or resume playback, function as a “Quiz Buzzer”, or any other action. The dome is available in several colours. The USB Dome Button is recognized by the PC as a “keyboard” —with only a single key. Microsoft Windows (and other operating systems) have intrinsic support for these devices. The USB Dome Button runs out of the box, no driver is needed. The button is fully compatible with “Game Show Presenter” and similar applications (see also the application note). For quotation requests or technical information, please contact us by e-mail. To visit us, see the address information page. Downloads: Key Configurator, version 2.2. 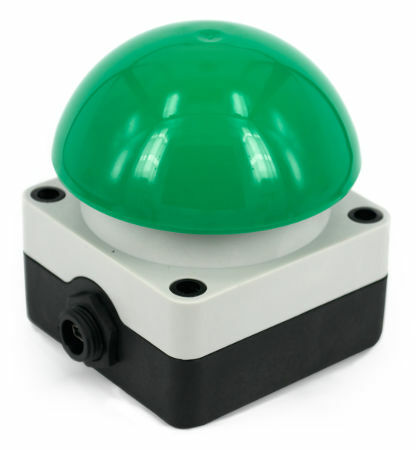 The USB Dome Button is a robust “emergency switch”-style button, for indoor and outdoor use. The sealing USB connector allows for splash-proof cable connection. Cables are available up to 4.5 metres. A “debounce” circuit avoids false triggering and an ESD protection filter on the USB input guarantees a reliable operation. As mentioned above, the PC or workstation recognizes the USB Dome Button as a keyboard with one key. The key to transmit to the PC is configured via a free configuration utility, see the Downloads section. In addition to standard keys, that utility also allows you to configure a few extended functions, such as to function as a “play/pause” button on a remote control, or as a mouse button. By default, the USB Dome Button transmits the keyboard key “1”. 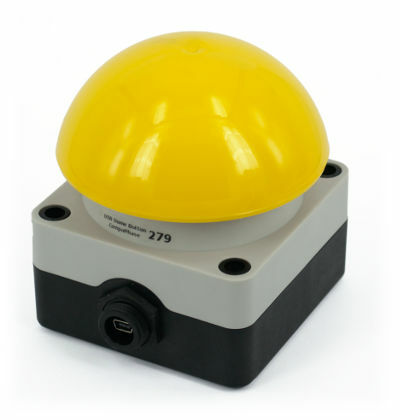 In addition to single-key transmissions, the USB Dome Button supports “macro commands” which allow to transmit a sequence of key strokes to the PC, including key combinations with “Alt”, “Ctrl” or “GUI” shift modifiers. With a macro, a press on the button can start an application or open a web browser on a specific URL. Multiple Dome Buttons may be attached to a PC at the same time, with each Dome Button (typically) configured to transmit a different key code. Dimensions Base: 85 × 85 mm, height: 45 mm, dome diameter: 94 mm; total height: 101 mm. Colour Base: black & grey; dome: red, black, green or yellow. Mechanical mounting Two 5.2mm mounting holes (semi-permanent mounting); 1/4"-20 UNC threaded insert (temporary mounting). Operating temperature -25 °C to +40 °C. Actuation force 20 to 25 N.
USB connector Mini-B, buccaneer (sealed IP68). USB interface/profile USB “HID”, keyboard profile, configurable key code. Power supply Powered through the USB connection. Debounce criterion 20 ms stable period. Switch latency 50 ms maximum, 35 ms average. Illumination Option: 12 high-brightness low-power LEDs. 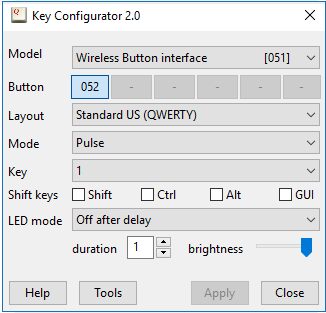 The guide to using the KeyConfigurator utility, to program the USB Dome Buttons, USB Pushbuttons and Wireless Dome Buttons to a key or key sequence. This application note describes how to use the USB buttons as quiz buzzers, with specific focus on the illuminated buttons. Key Configurator utility. See also the Usage Guide. 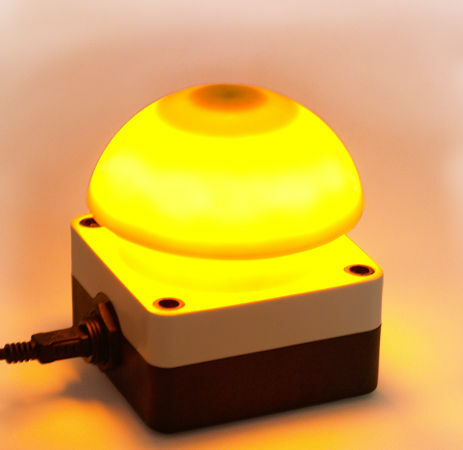 For buttons with LED illumination, you need this utility to control and configure the illumination. This utility can be used stand-alone or in combination with quiz master software.